Celebrating TWENTY Years of PLAAY! 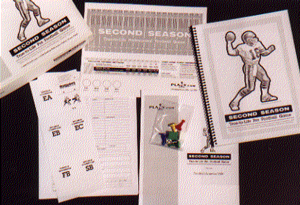 SECOND SEASON, 20 Years Ago: SECOND SEASON was the very first PLAAY Game, first published in 1999. Here's what the game looked like in 2000, shortly after taking on the PLAAY.com brand. "Presented in classic black and white!" I didn't discover sports until I was 10 years old. We'd moved to a small town (Sparta) in western Wisconsin, where all my sixth-grade classmates were Green Bay Packers fans. I didn't know anything about football, but I knew I'd better take an interest if I wanted to fit in. It didn't take long and I was hooked on the hard-hitting action, colorful uniforms and exciting pageantry of Sunday football! For Christmas and birthdays, I got the usual football-oriented gifts of the era, Mattel's "Talking football," Tudor's "Electric Football" (for me, the greatest Christmas gift of all time—better than Ralphie's BB gun! ), etc. As I got older and more knowledgable, though, I wanted something that would capture and re-create the real-life world of football, not just a generic football-themed gadget. Scouring the football season preview magazines together with my best friend Don Walterman, we narrowed it down to two games: APBA or Strat-O-Matic. 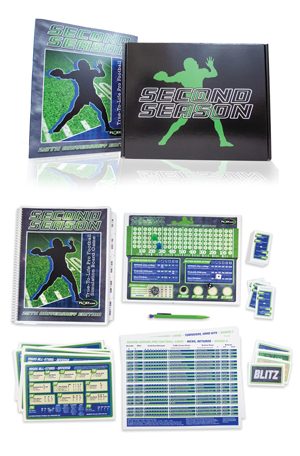 We sent away for information about both, and chose APBA, mainly because of the color brochure and free player card! We were so broke, we had to pool our meager funds to be able to afford the $18 for the game! I got the NFC teams, Don got the AFC teams. We split up the game boards and made typewritten copies of the charts we didn't have. And so began the sports board game sojourn. "The League" in action: Here we are, another evening huddled around the dining room table for the American Football Association, our draft APBA football league. That's me at left, reaching for my cards, the Milwaukee Mustangs. In the background are my brothers Todd (Charlotte Dragons) and Mark (New York Wildcats), and neighbor Tim Prell (Portland Panthers). This photo was taken in 1972. We played literally thousands of games of APBA Football over the next few years, systematically wearing out games and cards and ordering new ones. We got our neighborhood pals involved—we weren't the "cool kids," but we didn't care, we were endlessly captivated with our APBA league, which varied from eight to ten teams. We'd draft players, play a season, roll dice to see who "retired," then repeat the process. We played over 20 complete seasons, I still have the typed carbon copy sheets of stats and standings. In the process of playing APBA, I began to develop my own football game ideas. There were several things about APBA that I thought could be improved. I was also inspired by Program IV Pro Football, a simple tri-fold brochure game that I got for a dollar through the mail, after having read a teeny-tiny classified ad in one of the summer pre-season football magazines. I probably played fewer than a dozen games of Program IV, but the concept intrigued me: a game in which the essence of a sport was contained/captured, within the game engine, rather than the player cards, with ratings nuances that activated varied abilities. After high school, I joined the Army for three years, spreading the sports board game gospel in the various units and stations in which I served. 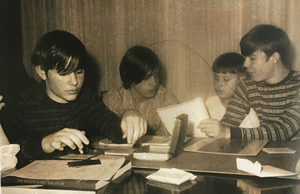 I started hammering out game ideas on the little portable typewriter I'd picked up, sharing them with the guys. We'd try 'em out, and talk about how they worked, and had fun. After my discharge, in college, this continued. My first football game idea was very APBA-like—so much so that I felt like I needed to disguise it by using letters instead of numbers on the player cards. I experimented with that idea for about a year and a half before scrapping it. In between classes at the University of Texas, I worked on a new football game idea, still bound by the APBA/Strat-O mentality, featuring complex player cards that had most of the game results printed on them. Eventually, it dawned on me that the cards could be simplified. I took a class in statistics and was captivated by the universality of the 80-20 rule and the bell curve distribution, and wondered how that might apply to sports and sports games. Theoretically, if 66% of results are common, then a sports game could focus on just the third that varies. It's analogous to Tommy Lasorda's classic observation about how every team wins a third and loses a third of its games—it's that third third that makes the difference between a champion and a cellar-dweller. So I reworked my football game idea to put the complexity into the engine instead of the cards. Things started to really take shape after college. Having landed my first full-time post-college radio job (Top 40 KSTT, Davenport, IA), I used my free time to develop the football game further. I had developed a 1 to 5 player rating system, with color coded team grids, position boxes activated by dice rolls. I made hand-written cards and played out the entire '59 NFL season, with good results. The highlight of this period was when the NFL went on strike, early in the 1982 season. Our radio station was looking for a good way to tie-in with fan frustration (Bears fans, as we were about 150 miles from Chicago), and in the staff meeting I suggested that we use my game to generate the results of that week's cancelled Bears-49ers game. The idea snowballed, and became quite the media event. I even got on TV! Here are some press clippings from the event. But light bulb moment during my time in Iowa was this: I discovered that I didn't really need five levels of ratings for a football game. I felt like, at the heart of the game, players either make plays, or they don't. The "2" (kind of poor) or "4" (kind of excellent) ratings, which admittedly were leftovers from my many hours of playing APBA, were actually rather superfluous. Simplified, that's where the 0-1-2 ratings system for SECOND SEASON was born. Radio Days (and Nights): My career as a top 40 disc jockey allowed me ample time to play and develop sports games. 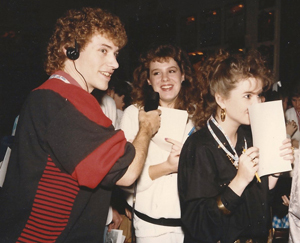 Here I am in December of 1986, a New Year's Eve live broadcast on KKBQ-FM (93Q) at one of Houston's teen-oriented venues. The 93Q crew was instrumental in fine-tuning SECOND SEASON football. Vince Santos, Elliot Segal, Ward Camp, Mike Caviel, Tom Entiwstle and many others—together, we played hundreds of games, mostly late at night after I got off the air. My radio career took me to Houston. Still single, and even more of a football fan than ever, the game developed further. By now, it would be recognizable as the game that's being played today. I introduced a group of radio station pals to the game, and we played it pretty much every week. I'd get off the air at 10 PM, we'd play football until 2 or 3 AM and then go to Whataburger to get breakfast tacos. At this point, the game was arranged into five clip-bound colored folders, based on the defense call. If a RUN defense called, you'd go to the red folder. PASS defense was green. Yellow and Blue for SAFE and BLITZ, with a gray folder for the special teams charts. We played a 10-game edition of the '86 season and had great fun. This is where the team sheets took over for individual cards. I did it as a time-saving method so that we could get started playing sooner, but quickly realized how much faster the set-up time was with the sheets instead of a stack of individual player cards. After that project, we then decided to keep the USFL alive by drafting our own teams from NFL cast-offs. I made the player list from actual NFL cuts, and rated the players based on historical or projected performance. We played three seasons of that. Along the way, we tweaked the game engine and worked out the bugs. The stats were looking good, everybody was thumbs-up about it—the game was ready. In the spring of '87, I met with lawyer to get stuff in order to manufacture the game. I decided on SECOND SEASON as the name for the game. My thought was, "what if you could rewind the calendar and play the same football season a second time?" I did research on printing, distribution, licensing fees: this was going to cost some serious money. Desktop publishing was just a novelty at this point, so the only printing option was to contract with a real-life, full-blown printing company and have a couple thousand copies printed. Still, I wanted to do it. Just as I was about to look into taking out a loan to finance manufacture of the game, I got a job offer in New York City, nights at one of the biggest, most influential Top-40 stations in the whole country, WPLJ, "Power 95." THAT was a tough choice: follow my football game dream, or my radio dream—? Rasslin' Roots: Here's the original incarnation of the wrestling game, from summer 1990. For lack of a better name, I called it "Big Time Wrestling!" 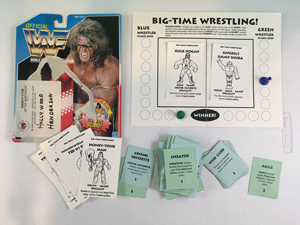 The fast-action cards were color-coded, blue and green, to tell you which wrestler was attempting to make the move. At left is the package art that inspired the game—note the "Hollywood Henderson" event name tag that I stuck to the package board! I was doing a radio station appearance, we were giving away WWF action figures as prizes. On the back of each package there was a clip-art style illustration of each available wrestler in the series. Brutus Beefcake, Hulk Hogan, Rowdy Roddy Piper, and so on. Something about it clicked with me. In short order, I made a very basic wrestling game that used descriptive words for each wrestlers skill set, activated by flipped cards. I made cards for the wrestlers, photocopied the back of the package art to get the illustrations, cut and taped those illustrations on the cards I'd made, and photocopied THOSE onto card stock. Voila! They didn't look fabulous, but they were pretty cool to me. I played a "season" with this game, and was really happy with the game flow and results. I shared it with a guy at out church who was a big wrestling fan, he and his son played it a TON. I continued to play it occasionally, then filed it away. After Minneapolis, it was back to the east coast (Long Island), and then on to a brief stint at a country station in Washington DC. It was a tough experience in DC that ended badly, but it did give me down time to think. Sports games were a nice distraction. I checked out some game makers/manufacturers in NYC, and those who got back to me strongly encouraged me NOT to proceed. I remember one guy on the phone telling me, "Make your football game for your friends, and enjoy it with them and just leave it at that." By now, I had an official SECOND SEASON game book, and while I waited for what was next career-wise, I used my computer to make team sheets for the '68 season to go along with it, just to have something polished. We ended up moving to Dallas. The DC job had gone so badly that it really shook my vision of who I was and what I should be doing with my life. I prayed a lot about it. I had always been a person of faith, but now even more so. Not knowing anything for sure, I enrolled at Southwestern Theological Seminary in Ft. Worth. Concurrently, I started working part-time quickly moving to full-time at the big Top 40 station in Dallas, KISS-FM. Guys at church got interested in my football game. We made a league, based on the WFL. Six teams, ten games. We expanded to eight teams for a second season, and had a grand time. After three semesters of seminary, prompted by a thoughtful read-through of Elton Trueblood's classic book "Your Other Vocation," I felt God's call—back to radio! We moved from the mid-cities to Dallas to be closer to the station's studios. This is where the internet happened. We had gotten online (AOL, phone modem!) mainly so that we could connect better with friends and family and I could more effectively prepare for my radio show. At some point, I got introduced to Jim Gordon's Sports Game Digest e-bulletin board. It was a weekly e-mail of posts, thoughts, experiences of sports board gamers. For many of us, this was revolutionary in bringing the community together. Through SGD I connected with Pete Ventura of Replay Games, as well as many other long-time sports gamers like Michael Owens, Vinny Mancini, and Dave Arlington. On SGD, I had a chance to post about SECOND SEASON Football and many people were interested. I sent out some copies and got great response. I remember a very long AOL text chat with Vinny Mancini about the game. At that point it was the game book and the '68 season, that was all. I eventually found myself sending out copies regularly, maybe one or two a week. It was starting to get expensive. Pete Ventura suggested I start up my own website. I had no idea how to do that. But the inquiries kept coming, and I was spending a lot of time with game correspondence. Eventually, I came to the conclusion that I couldn't continue to devote so much time without getting something for the effort. In the fall of 1999, I acted on Pete Ventura's suggestion, and hired a guy to do a website for me. Being in radio, it wasn't hard to meet people. He seemed like a decent guy. I wanted to use the domain name SecondSeason.com, but that was already taken. I wound up choosing SecondSeasonFootball.com at my web guy's insistence. Having him do my site was pretty costly, and really the site I got didn't look or work that great. I did make some game sales, maybe one or two every couple weeks. One day, though, my website wasn't up. I tried to call my web guy, and got no answer. I never heard from him again. 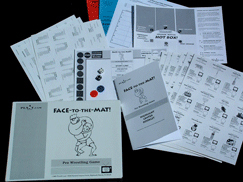 Early FACE TO THE MAT: The early version of FTTM had a smaller, staple-bound highlight reel booklet. The wrestler and fast-action cards are largely unchanged, though, from the original. This photo, circa 2000. So, I decided to do it myself. I bought a version of Dreamweaver (website design software), and figured out how to make a few basic web pages. I decided that I might was well put a couple other games out there that I had been working on, since I was on my own dime here. Wrestling was (I thought) finished. I also had this "Invasion of the Body Snatchers" game I'd made, which was pretty much finished as well. Since I was doing more than just football here, it was obvious that I needed to start fresh with a new domain name. I never liked the length of "secondseasonfootball.com" anyway, too many characters. I wanted something short, memorable, the fewer characters the better. At that time, you could still find four or five letter domain names. I thought PLAY.com would be great, but it was already taken. But what about using two "A"s? PLAAY.com? It looked kind of odd. I had some other ideas—I don't remember what they were, all four or five-letter combos. I think "sportz.com" was one of them. But I kept coming back to PLAAY. Maybe looking "odd" would make it more memorable? I went with it. I got my site together, figured out PayPal, set up an account for payment and e-mails, and I was in business! This was early 2000. From there, things began to roll. The first thing of note was some major changes to FTTM. Guys who played it liked the mechanics, but me not being a wrestling fan, there were certain things that needed to be fixed to make it more like real wrestling. The three-count kick-out was one of those great, early ideas. I also found a copy of a book on the psychology of pro wrestling—it actually wasn't a book, but rather a doctoral theses that somehow wound up on the sports shelf at Half-Price Books in Dallas. It was a treasure trove of insight! Reading this, it became obvious to me that the central plank of a pro wrestling game HAD to be the good-vs.-evil story line! I set about expanding the various Highlight Reels to capture this aspect. I have to mention here that Pete Ventura was a huge help during this stage. Not only did we share some regular heart-to-heart jubilation and commiseration, but we also joined forces in an attempt to keep sports board games relevant and alive. He had a baseball game, I had a football game, so we pooled our customer lists and did a couple of joint mail-out projects, splitting the cost of the postage and printing, each picking up a few customers from the other in the process. I'm indebted to him for his friendship and help. PLAAY.com got some good buzz in the sports game community, and I decided to expand. Not feeling up to taking on the sports board game Goliath's APBA and SOM, I decided on a contrarian strategy: I would develop sports games for which there WERE no alternatives. My first project: roller derby. I grew up with Saturday morning roller derby on TV, so I remembered it fondly. On eBay, I picked up a copy of Frank DeFord's "Five Strides on the Banked Track," the definitive roller derby book. The game came together fairly quickly after reading that, riffing on the FTTM highlight reels for the roller derby drama, and adopting the FAC system and match-track engine from FTTM as well. One day, I got a call from the president of the then-current roller derby association in the Bay Area. He had me make some games for him to sell at the arena, with a card set that used the names of the current skaters. Turned out that ALL of the games I sent were bought by the skaters themselves, they never even got to the arena for the fans! As an aside, several roller derby stars bought copies of the game over the years, including Jan Vallow. I wish I could remember the names of all the derby stars who have played ROLLER RUMBLE. Pretty cool. Even though I had determined to create games for sports that didn't already have games, that idea was pre-empted with the rolling of a 20-sided die. I don't remember how/why, but one day I found myself trying to see if I could roll a d20 in a straight line. It was pretty tough, the die tended to want to curve—kind of like a bowling ball does. That's when I had the idea for BOWL-O-RAMA. I spent a good amount of time rolling a d20 and marking where it landed. The placement of the triangle sweet spot on the BOR game boards was not arbitrarily chosen—it was borne out by hundreds of test die rolls! As an aside, I wonder how many people play the game in "spectator mode?" It's one of my favorite things about that game. I remember at our Minneapolis "All Saints Day" event in 2014, we concluded with a bowling tournament—a great memory for me. It became apparent that, just like real bowling, BOWL-O-RAMA d20 bowling is a skill some people have, some don't. LAX 1.0: The first PLAAY lacrosse game was CRASH & SCRAMBLE, pictured here. Some of the design concepts were later grafted in to the hockey game, which then promoted a re-design of the lacrosse game! Lacrosse was the next game on the design grid. I became interested in the sport back in the late '80s while working in New York, the pro league at the time had a team there called the Saints (and being a New Orleans Saints football fan, I was naturally drawn to them!). I always thought lacrosse would make a cool sports game. Andy Lewis, a long-time Philadelphia Wings fan and sports gamer (good combination! ), got me some great info on the game, pointed me to some resources. The game came together over the course of about a year and a half. Those who have discovered PLAAY Games fairly recently may be surprised to know that the first PLAAY lacrosse game was not LACROSSE BLAST—it was CRASH & SCRAMBLE. The game used a FAC deck, was the first game to use the triangle (offense) and square (defense) symbols. It was a pretty good game. However, the positive reception to HOCKEY BLAST prompted me to switch the lacrosse game engine. My thought was that I might be able to leverage some of the enthusiasm for HOCKEY BLAST to the lacrosse game. I felt (and still feel) that the only thing holding back pro lacrosse from becoming a major sport on par with the NBA and NHL is a lack of awareness. I specifically re-designed the lacrosse game so as to be able to use hockey players, if desired. (In the 1970s, that was exactly the plan of the real-life NLL, to serve as a summer replacement game for hockey, with hockey players picking up lacrosse sticks.) Again, my thought was the added familiarity might spur an interest in the game: if someone could play, say, the Red Wings against the Bruins in lacrosse—well, that would be cool! That idea never took hold, though. 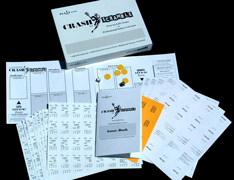 CRASH and SCRAMBLE is paid homage, by the way, in the game's main chart, where "6" is a CRASH result and "8" is a SCRAMBLE. Move ahead to the summer of 2004. In the radio biz, there was consolidation, decline, and revenue turmoil thanks to the huge debt of the various radio companies and the squeeze of free internet information and entertainment. This forced me to have to make a choice. I no longer had time to do both games and radio. Up to that point, the time requirement of my radio career had been (mostly) awesome: four hours a day and maybe an hour or two of prep time. (I did have to work six days a week, though.) The rest of the day was mine. Now, as radio budgets got tighter and station staffs got smaller, I was having to do more. And, there were rumors that our station would be sold, so I needed to make myself as indispensable as possible. Plus, I was working nights—and my kids were now in elementary school. I'd get home from work, they were asleep; wake up in the morning, they were at school. I had a tiny splinter of time, roughly 3:30 to 5:00 pm was all I really saw them. So, my wife and I decided on a rather drastic course of action: we would home school the kids ourselves. That would leave no time for sports games. I called Pete Ventura, explained the situation, asked if he would be interested in taking over SECOND SEASON. He agreed. You might find it interesting that Pete also showed interest in the lacrosse game, but unfortunately it never got the Replay treatment, due to Pete's time constraints. I made the sad announcement in July of 2004 that PLAAY.com was ending, spiked with the happy news that Pete would be carrying on the SECOND SEASON under the Replay banner. In September 2004, PLAAY.com closed down. From 2004 to 2009, there wasn't much PLAAY news, save for that generated over at Replay with SECOND SEASON. I had no time for sports games, as I attempted to help home school my kids and keep my radio career on life support. In 2006, I took a job as do-everything Operations Manager of a tiny AM classic country station in Dallas with maximum work hours and miniscule ratings. In 2007, we moved to Denver. Here's the "Reader's Digest" version of how that happened. The classic country station was going dark, owner was tired of losing money. I didn't know what was next, and was praying fervently, regularly. One Sunday afternoon, I was in our living room with my Bible and journal, praying—writing out my prayer, as I often do. I wrote, "God, I don't understand this radio uncertainty and turmoil. I KNOW that you're able to provide me with a good, stable radio job in an instant. Must I continue to wait?" As I was putting the dot on the question mark, the phone rang. My wife brought the phone to me—it was my old boss from Dallas, offering me a job as music director and mid-day talent for the big adult contemporary station in Denver! Funny how prayer and faith (or lack of faith) works, though. I immediately began to get nervous. We had been in Dallas for thirteen years, owned our home, had roots. We had family within driving distance, in Houston (Cara's family) and San Antonio (mine). And, wouldn't this be just another typical radio job, two, maybe three years and THEN what!? I'd have to look for ANOTHER job? Plus, Cara had just been offered a full-time teaching job at our kids' school, with a great staff. But my faith said that with a prayer response like that, you have to obey. So, we moved to Denver. Then, six months after I got to Denver, CBS announced that they were selling all radio properties outside the top 10 markets. Right away, the staff cuts began as CBS tried to make the cluster look as profitable as possible for potential buyers. The sale took a year—a very difficult year. There were layoffs every four to six weeks, with the departed people's work load distributed among the survivors. In the end, a small-town company bought the stations, and gave pretty much everyone the choice of taking a 50% pay cut or getting fired. Out of work again—just like I'd figured I would be. So much for following God's lead, right? It was a dark time, I had to really hang on to my faith. My wife and I had agreed when we moved from Dallas that Denver would the end of the radio U-Haul US Tour, for our own sanity and for our kids' sake (they were entering the middle school years, where no kid wants to be the new kid). So relocation was never an option. I began to think about reviving the game business. I didn't see how it could work, based on the financial numbers of the three-plus years I'd done it in Dallas. "Until one is committed, there is hesitancy, the chance to draw back, always ineffectiveness. Concerning all acts of initiative (and creation), there is one elementary truth the ignorance of which kills countless ideas and splendid plans: that the moment one definitely commits oneself, then Providence moves too. A whole stream of events issues from the decision, raising in one's favor all manner of unforeseen incidents, meetings and material assistance, which no man could have dreamt would have come his way." Whatever you can do, or dream you can do--begin it! Only engage, and then the mind grows heated. Begin it, and the work will be completed." I prayed more. As preposterous as it seemed, I felt like God was giving me the green light to re-start the game business, right now. I decided to go for it. I went out to the wilderness area behind our home and built a little "Ebenezer," with wooden sticks and a dime to represent the financial aspect (it was the only coin I had in my pocket at the time!). It was still there, last time I checked, a few years ago. Then, I swallowed hard (money's always tight when your income stream is zero!) and went to the Mac store and bought a used laptop computer. I went on eBay and found a copy of Adobe Creative Suite 2—version 5 had just been launched. Finally, I went to our local Micro Center and bought a color laser printer. This was March, 2009. I re-launched PLAAY.com in May. The same website as before, which I had archived. Same strategy, focusing on minor/lesser sports. I added DEMO DERBY SMASH-DOWN, a new game which I had been working on here and there between 2003 and 2009. First day back online, I got a warm welcome, and felt like I was among friends again. 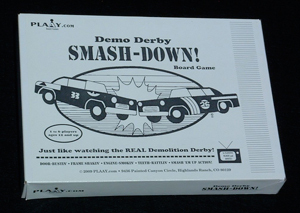 Back Online in 2009: PLAAY Games returned to the web May, 2009 with DEMO DERBY SMASH-DOWN Demoltion Derby Game added to the line-up. This was in keeping with our original strategy of offering board game treatments of sports which didn't already have them. We relaunched with a continuation of the "classic black and white" presentation. It wasn't long after launch that I decided I needed to add color to the games. (From the beginning, I had produced my games in "Classic Black and White," to keep costs down.) But This didn't translate well to the web, and didn't present the games in their best light, especially if I was hoping to grow. So I re-did all the cover art for the games, and created an entirely new website (badly needed, the old site was sorely out-dated) to highlight this. I talked with Pete Ventura. He said he was caught a bit off-guard by my return to the game biz, but that maybe it was good timing as he was about to run out of the new SECOND SEASON game books he'd had printed. I told Pete that my idea was to let Replay continue to publish SS, and I would do a Canadian version of the game for my "football fix." Pete insisted that SECOND SEASON should revert back to PLAAY. Both happened. I introduced COLD SNAP Canadian Pro Football in the summer of 2009, and SECOND SEASON came back to PLAAY about six months later, in January of 2010. The COLD SNAP launch was the worst I ever had, and ever WILL have. I rushed production, partly out of eagerness (desperation?) to get the game business quickly going, partly to hit a timeline I hammered into my head to make the game available for the opening week of the new CFL season, and partly out of my lack of knowledge of the nuances of Canadian football. Long story short, there were so many issues that I wound up sending everyone a revised game book a couple months after the game was released. I learned a tough lesson there, but it has served me well: "take your time, try hard to get it right the first time." It took me nine months to find another radio job, and the job I did get was a very poor one. I was hired by Dial-Global satellite radio in November of 2009 as night talent for their new "localized radio" initiative, called STORQ (Satellite Technology Offering Real-time Quality). What this meant was that I would be producing local content for nearly 100 radio stations, simultaneously, cranking out voice tracks one after another. I would do a track for one station, hit "send" to plant the track in the remote station's computer for broadcast over their airwaves a few minutes later, and then do another. 50 to 70 of these every hour, for five hours straight. It was a beating. My voice has still not recovered fully. The plus was that I was broadcasting at night, so I had day times available for the game business. During that time, "Providence" (as Goethe would put it) gave me some great game ideas. At some point, I realized that it wasn't the optimal use of time to develop games for niche sports—better to go for the major sports, and accept a smaller piece of the pie, if needed. That opened up some solid opportunities. I had been wanting to do a Hockey game, and stumbled across a mechanic to make it work. My son and I had been playing a Star Wars Pocket Model trading card game. You'd buy them in packs and build the spacecraft with pieces punched out of what looked kind of like a credit card. Each craft was rated for, among other things, attack and defense. You'd roll six-sided dice for both, and if the die rolls fell within the attacking craft's attack range and outside the defending craft's defense range, you'd score a hit. I thought, "why couldn't this work for a hockey game?" It DID work, perfectly! Strangely, the hockey game gave birth to RED WHITE & BLUE RACIN'(if you own the game, you already know this story!). After I re-started PLAAY.com, I met Dave Richter, who lived in Westminster, CO and was one of the original SECOND SEASON purchasers in 1999. He had a little home-made NASCAR game he was playing around with, and I dug out notes I'd stowed away from 2003, early ideas I'd had for my own NASCAR game. We started talking about the way a NASCAR race works, how it's sort of like a pyramid, with drivers constantly trying to maintain and/or improve on their position. That's where the "King of the Hill" idea for RED WHITE & BLUE RACIN' came from, where guys would try to move up the pack and get to a position where they could knock off the leader. I thought that was a great basis for a stock car game, but it wasn't until about a year later that the idea occurred to me that it might be possible to use the goal scoring methodology of HOCKEY BLAST in the context of challenger-defender for NASCAR. Once we started experimenting with that, everything else fell into place relatively quickly and easily. It was your classic "overnight success" that was literally ten years in the making. While games were coming together, I was also meeting people who could help. Again, I go back to the Goethe statement about Providence stepping in—this was not coincidence. Andy Lewis got me plugged into the World Boardgaming Championships in Lancaster, PA (since moved to the Pittsburgh area), letting me set up one year at the GMT booth and helping me arrange everything for my own booth the next two years. Steve Tower met me at the WBC one year and helped at my booth, hung out with me. Al Wilson found PLAAY Games via RED WHITE & BLUE RACIN'. The pieces were falling into place. The STORQ job ended in 2012, Westwood One bought out Dial-Global and laid off about half the work force (including me). No radio jobs in sight, I was totally on my own. PLAAY Games was established, but nowhere near self-sustaining. But what other options did I have? I sent out a flurry of resumes for non-radio jobs, and rapidly realized that my radio skill set did not make me qualified for much else. I applied for a job driving a school bus and was offered the job, but the hours required (split shift, 4a-9a, 2p-6p) would have killed the game biz. I went to work at the local Office Max, thinking I could print my own stuff and maybe make a few bucks doing it. Instead, they had me hanging pens on racks and changing shelf labels. Ugh. There's a scene in the movie "Castaway," where Tom Hanks' character Chuck Noland realizes that living alone on a desert island is not really living at all. He considers ending it all, but walks away from the cliff. He then hatches a desperate plan to escape the island by marshaling the scant resources he has at his disposal and challenging the mighty ocean with a frail collection of sticks and sheet metal that he's lashed together with vines, using his own two hands. I watched that movie one night during this dark period, and it resonated with me very strongly. I felt like it was me and my second-hand laptop and out-of-date software and home-made website against the mighty ocean of e-commerce, and the odds were not good. (I don't mean to be over-dramatic here, just telling you how I felt as this all went down!) Still, I felt that God was leading in this direction and I knew that I had to give it a shot. So, I put everything I had into the game biz. It was either going to somehow work, or I was going to be dashed to pieces by the pounding waves. There were many sleepless nights. There was the computer crash, New Year's morning 2013, that could have ended PLAAY Games right then and there. I found great comfort in Psalm 107, especially verses 23-31: "Some went out on the sea in ships; they were merchants on the mighty waters. They saw the works of the Lord, his wonderful deeds in the deep. For he spoke and stirred up a tempest that lifted high the waves. They mounted up to the heavens and went down to the depths; in their peril their courage melted away. They reeled and staggered like drunkards; they were at their wits' end. Then they cried out to the Lord in their trouble, and he brought them out of their distress. He stilled the storm to a whisper; the waves of the sea[b] were hushed. They were glad when it grew calm, and he guided them to their desired haven. Let them give thanks to the Lord for his unfailing love and his wonderful deeds for mankind." Many people have read that Psalm—I've LIVED it! Today's PLAAY, and Tomorrow's: Our 20th Anniversary edition of SECOND SEASON Pro Football Game is a foreshadowing of where we are headed as a company in the years ahead. The look has changed, as well as the technology, but our mission statement remains the same: "Preserving and advancing the grand pastime of table-top sports board games." We want to ensure that the hobby stays vibrant and relevant in the years ahead. Thank you so much for being part of this! I knew that if PLAAY Games was going to succeed at the level I needed it to, I had to offer a baseball game. Baseball is the "Mother of All Sports Board Games." If the sports board game industry was a pie, baseball would probably be two-thirds of it. I did have a baseball game idea, something I'd put together in the early 2000s. But it was something really, REALLY different, a qualities-based game. I went back to my archives and dug out the files. I asked myself, "Does the world really NEED another baseball board game?" For a game to get foothold in a very crowded market, I reasoned, it would HAVE to do something better or different than what's already out there. With Strat-O-Matic and APBA having a 50+ year head start, I knew "better" was going to be tough to achieve. That left "different." And, I had something different. So, different it was. I spent a great deal of time thinking about ways a baseball game could be even MORE different. I came up with three basic concepts: 1) a "blue sky" approach where you're creating history rather than re-creating it; 2) incorporation of intangibles, and 3) expanded managerial options that included psychological elements not just strategy decisions like bunting or hit-and-run. I play-tested and refined the game with a project that featured the '69 Seattle Pilots (Those who know me know that I am a lover of bad teams! ), I was pleased with the results. It was here that I really connected with Al Wilson. Al had played/enjoyed the NASCAR game, so I sent him an advance copy of the baseball, thinking he might be able to give me some insights about what people might think about it. Al loved it! Many other PLAAY Gamers provided great feedback, too, most of them are listed in the game credits: Gary Brown, Matt Crawford, Mike Owens, etc. I think that it helped that these people were already familiar and comfortable with my sometimes-off-beat approach to sports games. Still, as Al can tell you, I was pretty nervous as the release date drew near. Looking back now, six years later, it was the release of the baseball game that achieved critical mass for PLAAY Games. The early reviews were generally positive—some people loved it, others made no secret about how they hated it. But no one disputed that it was different from what had come before—it was. Good or bad, it got people talking about "a baseball game with no numbers." And now that thousands of games have been played and posted, I do feel both validated and vindicated by the results the game has generated and the fun that's been had. And many of those new baseball folks embraced other PLAAY Games as well. After baseball came soccer—another great idea that was sparked by a "coincidental" meeting. At the 2013 WBC, Steve Hanzelman (local guy, big soccer fan) asked me, "Why don't you make a soccer game?" It piqued my interest, we talked. I thought about the similarities between hockey and soccer. I came up with the idea to make goal scoring a two-stage process (needing to succeed at BOTH creating an attack AND putting the ball into the net), which seemed to capture the spirit of soccer. Plus, it generated action/drama to fill the gaps between the goals, making the game more fun. Then came golf. If you own the golf game and have read the liner notes, you know how PLAAY Golf was headed toward being GOLF-O-RAMA rather than HISTORY MAKER GOLF! Again, divine intervention. And again, helpful people showed up (not) by coincidence to help make the game great: Tom Kerwin, Peter Pruefer, Dr.Thomas Cline, and others. So here we are. Thanks be to God. The business has grown to be self-sufficient, enough so that my son Sam has signed on to help. We have some great ideas ahead, it's exciting and invigorating to have younger, fresher, more modern thinking in the mix. Still, we pray. It's never easy, and there are storms always brewing. I'll conclude with a word about community. I'm endlessly grateful for the congenial, affable, inclusive and creative spirit of the PLAAY Games community. I think it's the fuel that keeps this thing going and the difference-maker between PLAAY Games being a hobby and a business. A heartfelt thanks to each and every one of you—many of whom I hear from rarely, or not at all! Blessings upon you! And now, on to the NEXT 20 years of PLAAY!